EDITOR’S NOTE: This summer, we’re focusing on themes of immigration and migration in music both here at NoDepression.com and in our print journal, and this story is an excerpt of one that will appear in the upcoming print issue. Don’t miss a thing! Subscribe now and receive four issues per year, each with 120+ page of ad-free writing and artwork diving deep into the music you love. On a March afternoon in Nashville, a spring storm creeping across the city, I walked down the hallway of the Schermerhorn Symphony Center toward 34 very rare and remarkable violins. 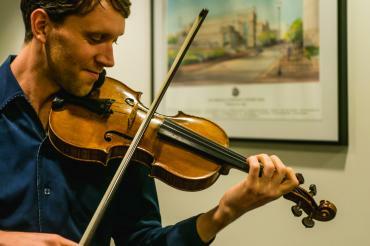 The Violins of Hope travel around the world regularly (recent stops include Birmingham, Alabama, and Cleveland, Ohio) to teach history and foster interfaith dialogue through performances and exhibitions. Thirty-four of these instruments made the trip to Nashville, which included performances with the Nashville Symphony and an exhibition that is on display through May 27 at the Main Public Library. When prompted to pick a violin to play — an impossible task — I didn’t know where to start. Weinstein seemed to sense my hesitation. He pointed one out and suggested I try it. At first glance, it was one of the plainer-looking violins, but its simplicity appealed to me. I inspected it closer, noticing a very subtle Star of David engraved into the wood that adorned the back of the instrument, just below the violin’s heel. I asked what Weinstein knew of the history of this particular violin. “The man who made it, Yaakov Zimmerman … was one of the first Jewish violin makers of his time,” Weinstein explained. He told me the violin was built in 1924, and that the label, in Hebrew, reads, “I made this violin for my loyal friend Mr. Shimon Krongold.” Zimmerman, as it turns out, taught Weinstein’s grandfather, Moshe Weinstein, violin restoration and maintenance, which meant the younger Weinstein had a personal connection to this instrument. At first, the violin felt quite foreign in my hands. A classical instrument like this is set up with an amazing balance of tension that powers a sound that can cut across a big concert hall, ringing and triumphing over an entire orchestra playing at once. In my hands, more used to the quieter, quicker world of stringband and dance music, the priorities of sound production are very different. Drawing upon all that my limited classical training had given me — reaching back to my days studying at the Queensland Conservatory in Australia — I obliged the challenge and opportunity to honor Shimon Krongold and his old violin. I offered a few folk melodies on the violin, including a waltz called “The Song of the Tui” composed by my great-great-grandfather (who was also named George) in New Zealand, dating back to around the Second World War. In particular, playing this tune brought a personal moment to my time with the Krongold violin. I learned “The Song of the Tui” from my mother, Karen Jackson, who learned it from her father, David Cloughley, and so on, dating back in the family to its composer, my great-great grandfather George Dickson. Performing this song on Krongold’s instrument was both a nod to my own family lineage of fiddle players and an echo of the violin restoration lineage in the Weinstein family. Read more by subscribing to No Depression here. George Jackson is a New Zealand-born, Nashville-based fiddle and banjo player. Currently he tours as a member of the Missy Raines Trio and writes and records music for his own projects. In his free time, George brews his own beer and enjoys cooking Cajun food.